With the new year, I’ve made the goal to start buying more and more wholesome and fresh foods to help foster a healthier lifestyle for my family. Just yesterday I managed to shop only the perimeter of the store, loading my basket with lots of fresh fruit and vegetables. My family on a whole is pretty good with vegetables, but I would really like to see us eat more fruit and less bread, crackers and pasta items. My goal with our family dinners is to make at least 2 servings of vegetables in addition to the protein, and add fruit whenever possible. I also am making the goal for us to stay away from sandwiches and pizza at dinner time. I think carb loading earlier in the day is much better than right before bed. 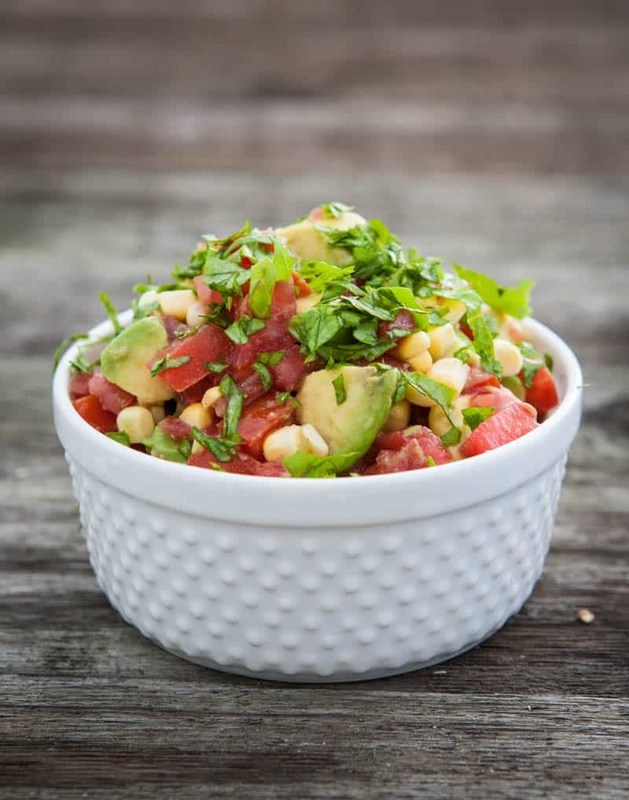 For tonight’s dinner, I’ve prepared this fresh corn, tomato and avocado salsa to top a piece of fresh salmon that has been seasoned with salt, pepper, cumin and Mexican oregano. I’ll serve it over a bed of quinoa with side salad and sauteed zucchini and onion. Since we live in Florida – it’s pretty easy to enjoy fresh produce because we have some great fresh, wholesome and local options available year round. 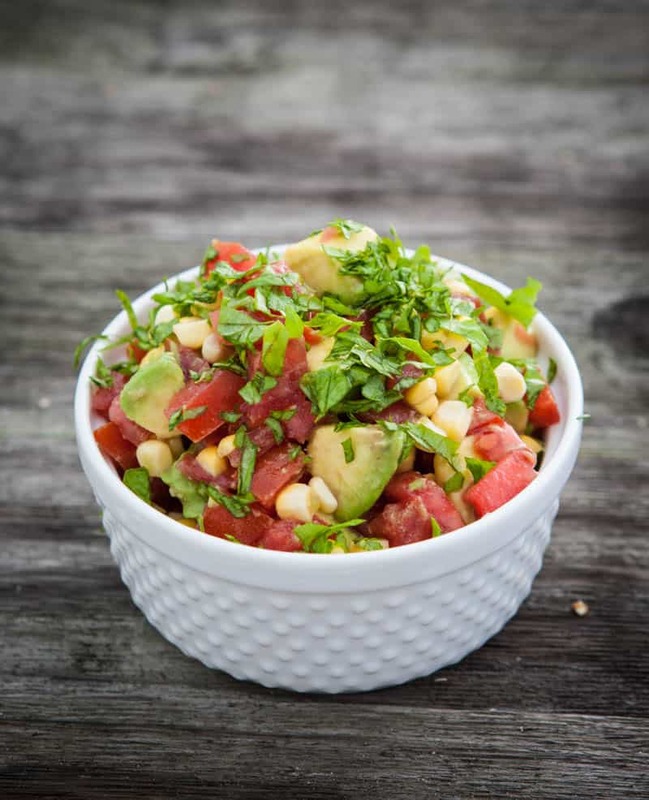 In January, when everyone is in the country is suffering through snowstorms and freezing temperatures us Floridians are able to brag about fresh tomatoes, avocados and corn! Besides all the wonderfully fresh citrus, we have a tone of fresh fruits and vegetables in season too. Be sure to like Fresh from Florida on Facebook and follow @FreshfromFL on Twitter too! 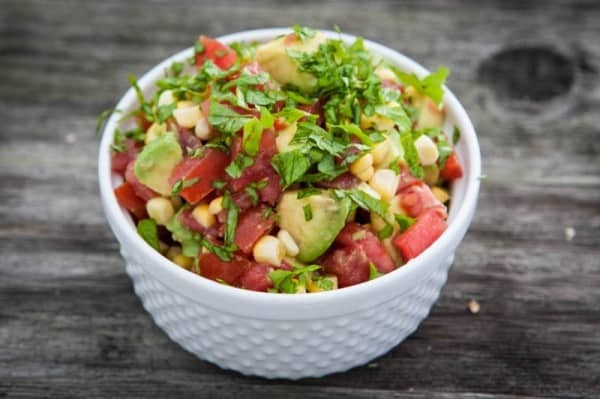 What are some of your favorite recipes featuring corn, avocados and tomatoes? Taste and adjust seasoning with salt, pepper and hot sauce. Love how fresh this is!!! Would be perfect on a taco! This looks so fresh and delicious! I have relatives that winter in Florida who always send us fresh citrus fruit. It’s a highlight of the winter months! This evening requires a good salsa. This looks fantastic! Perfect timing, I’ve got a lonely avocado I was just wondering what to make with! I’m always up for a good salsa recipe – love how light and fresh this sounds Angie! I love salsa & guac, so the combo looks great to me! Gosh that look goods, so many different flavours there! Thanks so much for sharing! So fresh and yummy looking! Looks like it would pair with lots of yummy dishes.